STOP! 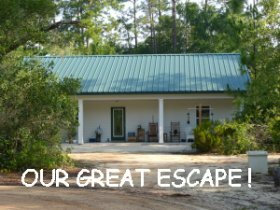 If you have just arrived at this website looking for passive hydroponics, you might want to go back to page one of this mini-farm plan. The grow room must be kept cool. Use a fan on low in there to cool it down. HID lamps will really add some heat. You can order this lamp and bulb here: Cheap Lighting. You can get off much cheaper by getting a fluorescent “grow stick” at Walmart for about $25, but you will not get the lush growth a better light setup will produce. 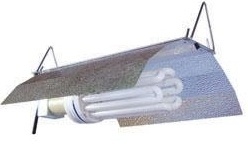 Also, for best results, upgrade to the 200 watt bulb listed on our supplies page. If you are interested in fruiting veggies like tomatoes, or serious herbs, you will have to upgrade to an HID lamp. Learn more about HID lighting and see our special combo lamp deal here: Hydroponic Lights. We highly recommend the Flora Series nutrient solutions put out by GH (General Hydroponics). This stuff is superior, easy to use, and reasonably priced. It consists of 3 parts (Flora Grow; Flora Micro; and Flora Bloom). If you have hard water, get the Hardwater Flora Micro instead. For this smaller garden, order a quart of each of the three solutions: Cheap Nutrients. Stick with Flora Series, follow the label directions, and you can't go wrong! The growing area (and therefore nutrient bucket) should be kept cool for passive hydroponics (55-70°). This is especially important for the cool-season crops like lettuce and broccoli. Learn more about hydroponics nutrient solutions here: Hydroponic Solution. We also provide a nifty little mixing chart there for the Flora nutrients that you can print out and save. For each 2-gallon batch of nutrient solution, add 2 tsp. of each of the 3 parts, separately. Never mix the nutrient solutions together, only add to the water. As the plants mature, change the ratio of the nutrient solution as directed on the bottles, or in Stella's mixing chart. pH- It is a very good idea for any serious hydroponics project to keep the pH of the water in the proper range, which is 5.5 to 6.5 (6.0 is ideal). If the pH is out of range, some of the nutrients get “locked out” and the plants suffer. 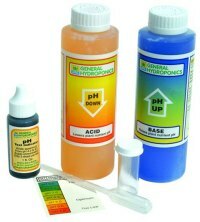 GH puts out a simple test kit with pH up & down solutions cheap. It will last you through many gardens: Cheap Nutrients. We recommend a 50/50 Coco Coir and perlite mixture for the AutoPots. Line the bottom of the pots first with the provided root mats. You cannot use LECA (Hydroton or clay balls) in this system. This is a brick of Coco-Coir, you can order one here: Cheap Hydroponics media. Perlite can be bought at any garden center. Coco Tek must be ordered from a hydroponics supplier. Learn more about hydroponic growing media here: Hydroponic Growing Medium.